Every once in a while that special piece of furniture falls into your lap unexpectedly and without warning. Now that the word is out and friends and family are aware of my blog, I have had interesting items rescued and brought to me to experiment on. That was the case with this next project which also proved to be my most challenging yet. 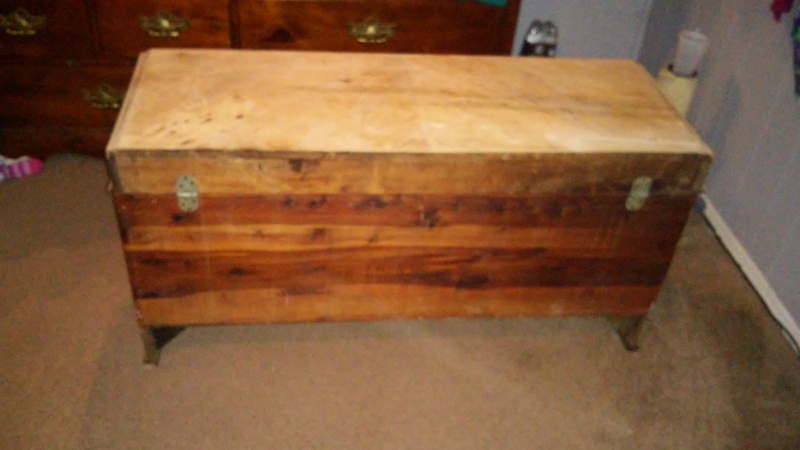 The same friend and co-worker who brought me my “You had me at half table” project approached me about a cedar chest she had sitting in her garage. She needed to make room and could no longer keep it, and wanted to know if I would be interested in giving it a good home, and taking it off her hands. The outside of the chest was in rough shape, but the inside was still perfect. After all these years, it managed to maintain its trademark cedar smell. She inherited the hope chest from a neighbor who was about to place it out on the curbside. My friend rescued it, recognizing this diamond in the rough deserved a second chance at life. 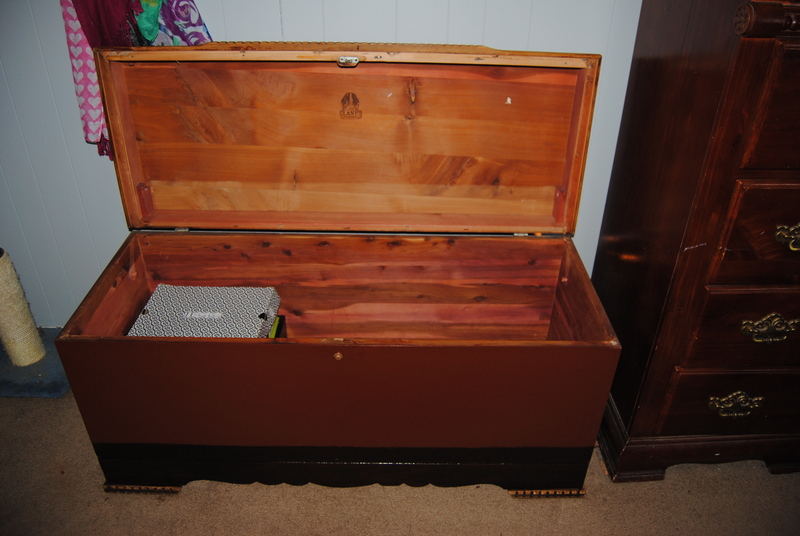 Adding to the excitement was the fact that I had always wanted a hope chest of my own. I didn’t mind having to put some work into restoring one, and I graciously accepted the offer. I was really excited and looking forward to working on a special piece like this. Initially I was concerned about transport, but I was relieved when it fit in the backseat of my car. I already had a spot for it in my bedroom. It seemed like it was fate. 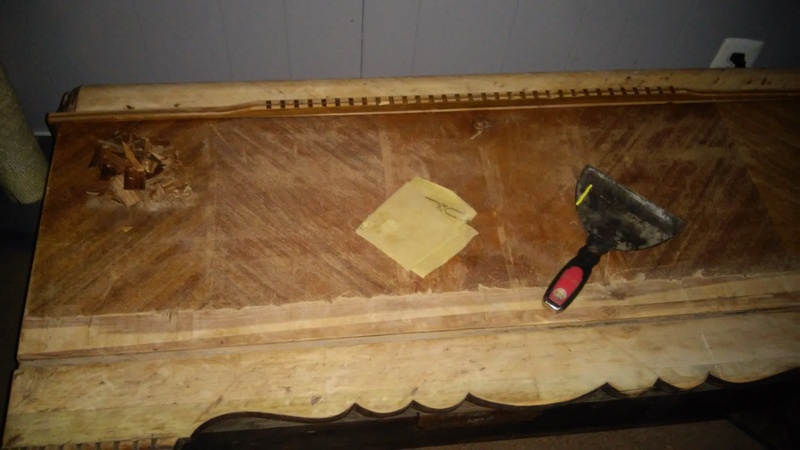 For a while, it sat untouched and the veneer began to peel, and I peeled it off little by little, while I figured out a plan to bring it back to life. I began researching the piece online. I opened the trunk and inside I found a card outlining the moth insurance policy. The card also encouraged it’s customers to “buy victory war bonds.” I knew from that moment on this was a vintage piece. The tag also listed the maker of the piece. The Lane Company Altavista, VA. The name was also burned into the inside of the lid. 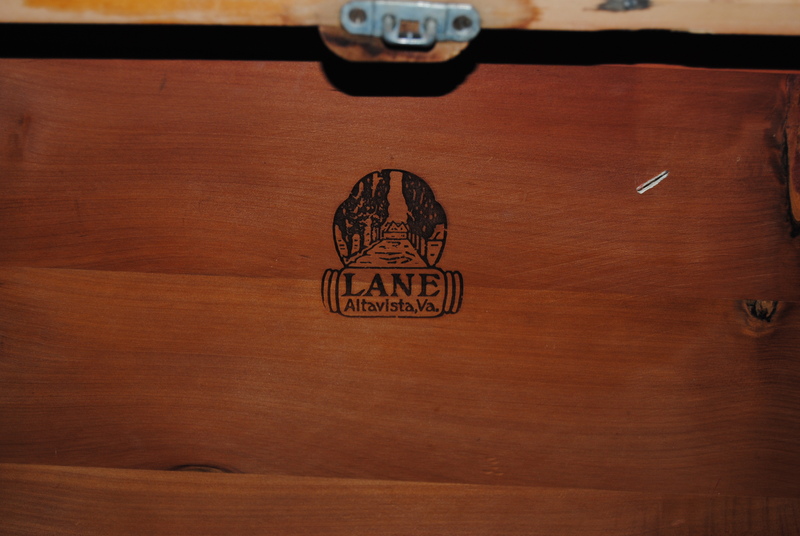 Founded in 1912 by John and Ed Lane, The Lane Company of Virginia, became one of the leading makers of Hope chests in the United States during World War I and World War II. 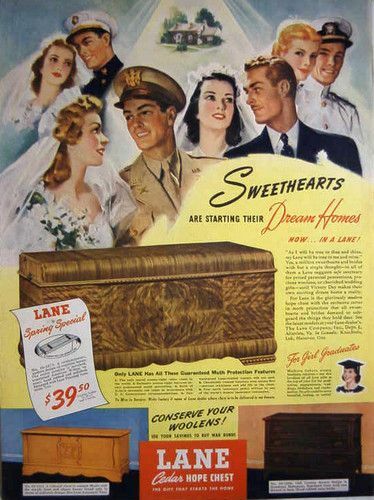 During that time, it was tradition for young girls to have a hope chest to bring with them into a marriage. The company launched a massive ad campaign which even included child star Shirley Temple as a popular spokesperson for the company. Every piece was stamped with a unique serial number and style number. Reversing the serial numbers is what helped me determine its age. This one was manufactured on 8/18/1934. 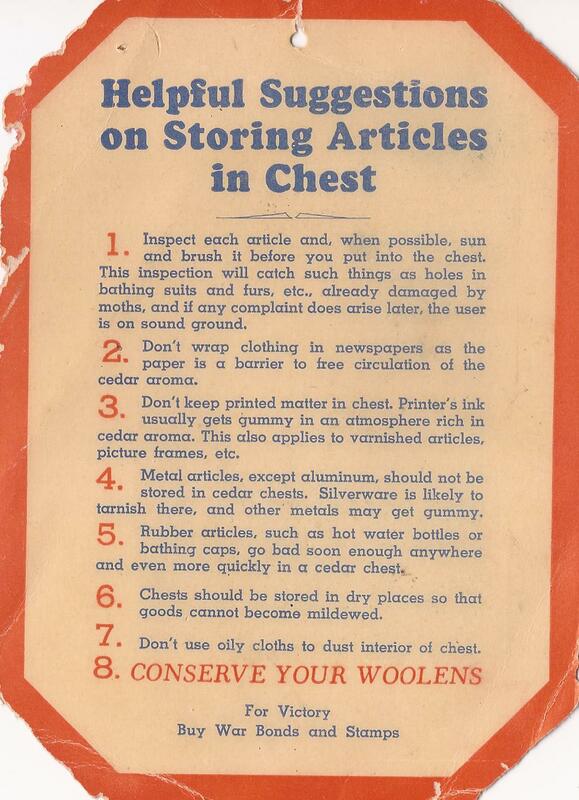 The chest was waterfall design done in an art deco style which was also popular during this time. 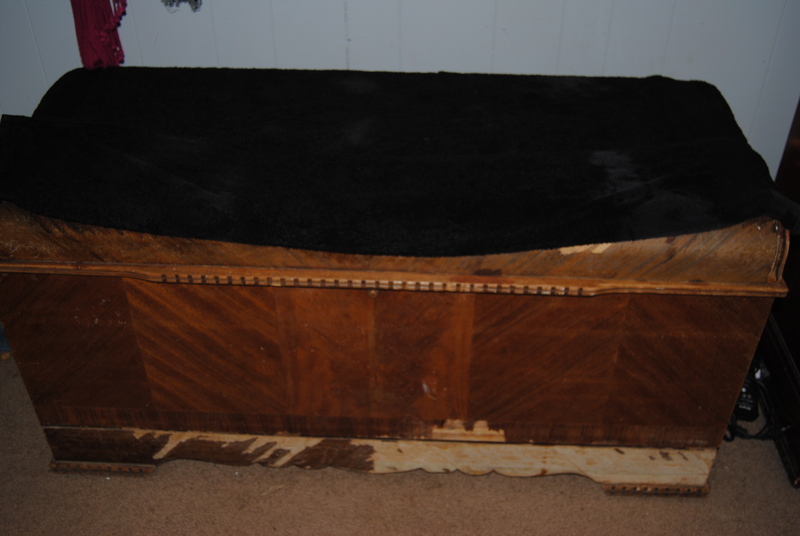 The chest itself was in good shape, but the veneer was not. It was stored in a damp place for a long time, and much of it was peeling or bubbling up. I knew removing this would take a lot of work. I also discovered that the original lock had been recalled. Sadly there have been cases of children suffocating inside after becoming trapped as recently as 2014. The good news is Lane still has replacement locks available on their website. Due to safety concerns, I went online to order one here. The lock ships in 4-6 weeks. It is important when purchasing vintage furniture to pay attention to recalls. I was glad to have stumbled upon this fact during my research by pure accident. With minor cracks in veneer, it is possible to buy wood filler/puddy and “patch” and sand the areas, but in this case the veneer would have to be removed entirely in some areas. I read a few articles online, and I tried various techniques for easily removing veneer. Let me start off by saying there is no easy way to remove veneer. I found it to be a long, risky and tedious task. The one technique that worked best was using a hot iron and a damp towel. I soaked the towel in warm water and placed it on the area of veneer I wanted to remove. I then heated up the iron and placed it on the area allowing it to sit for several minutes. This softened the glue enough to allow me to use a scraper to remove large pieces of the veneer. unfortunately, smaller pieces broke off and I ended up repeating this process many times. The biggest challenge was scraping and removing the veneer without damaging the wood underneath. Please also note that once you use your iron for this task, it becomes designated only for this task. The glue from the veneer burns the iron permanently and it can never be used to iron clothing again. This process was completed during the course of a few days. I would work on a small area nightly. The veneer removal seemed to be taking forever until it was boosted by a snow day and some unexpected free time. I used a belt sander to even out the larger areas and hand sanded the more delicate and smaller areas. 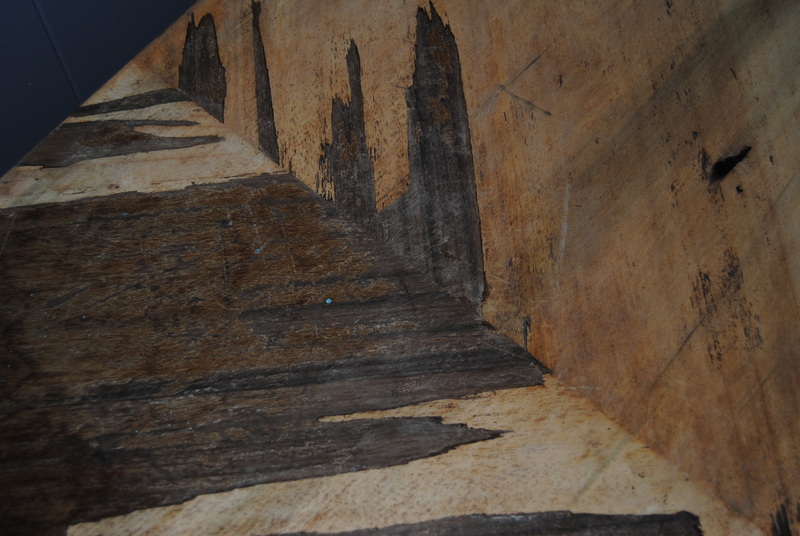 The areas on the piece that still had veneer I carefully hand sanded. Using a belt sander can cause damage to the veneer. Once the sanding was completed, The piece was ready to stain and seal. 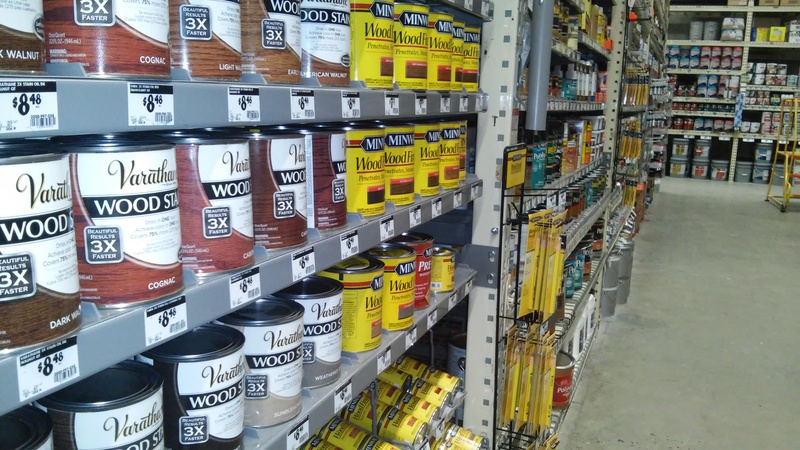 I trudged up to Home Depot in the snowy slush and shopped for a suitable stain and polyurethane seal for the exterior. The colors that I initially wanted they did not seem to have in stock. This did not make the aisle look any less intimidating to me. 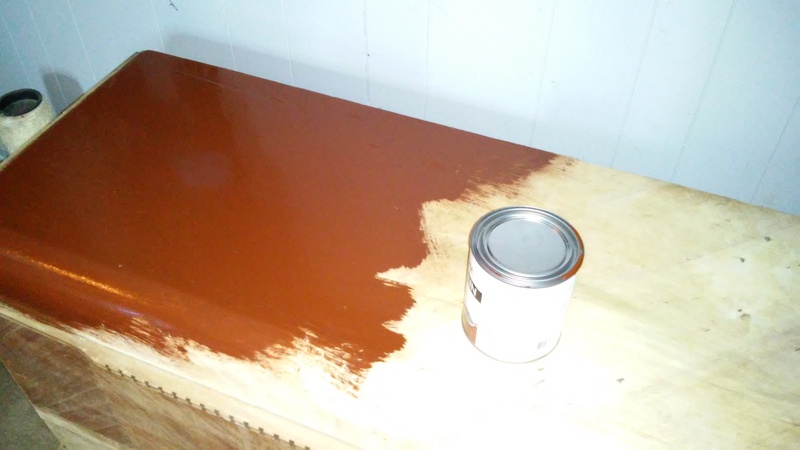 I decided on a color called “Cognac” and a clear semi-gloss polyurethane sealer. I already had a small can of Minwax Jacobean at home that I was planning on using for some of the trim. I began applying the stain and it was a little darker than I expected, but it closely matched our bedroom furniture like I had hoped. I then painted the entire piece. 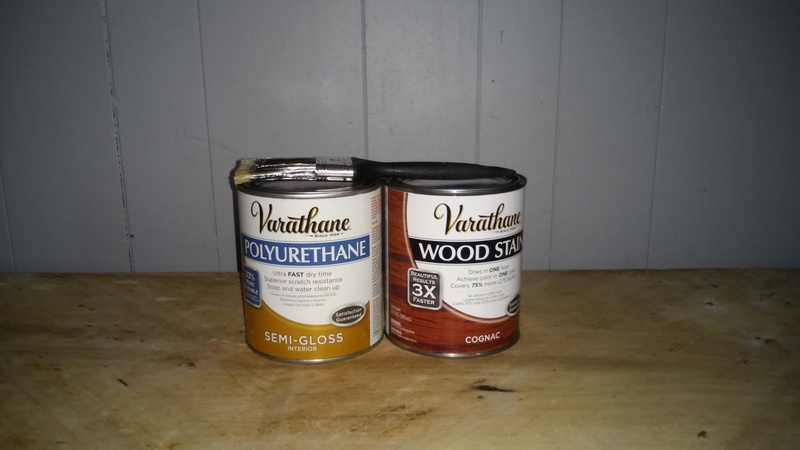 I was happy with the Varathane brand stains as it dried quickly and had less odor compared to other stains I have used in the past. I used the Jacobean colored stain to paint the trim and highlight the grooves and detail in the lighter wood trim. To me adding the darker color helped bring out some of the unique design qualities of the piece. It took about two coats of stain to cover all the areas. Once the stain was dry (It took about 24 hrs) I applied two coats of the clear semi gloss polyurethane to seal the chest. 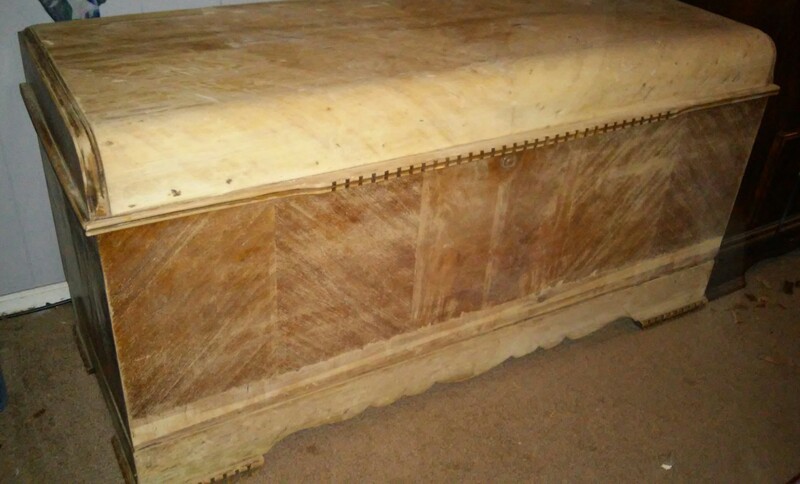 Although I could not restore the chest to its original state, I am pleased with how elegant the piece looks now. It fits in beautifully in our bedroom and I look forward to storing special items inside it and treasuring it for years to come. 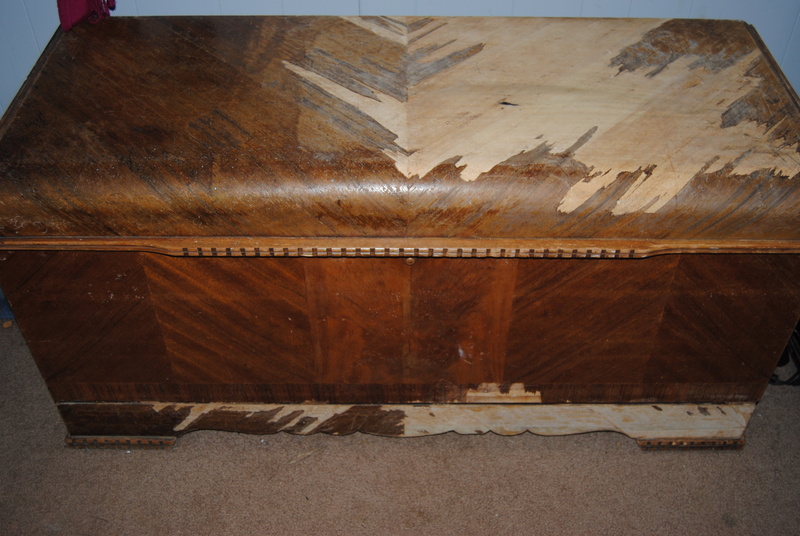 You have done a wonderful job on this antique cedar chest. You have put a breath of fresh air into it. 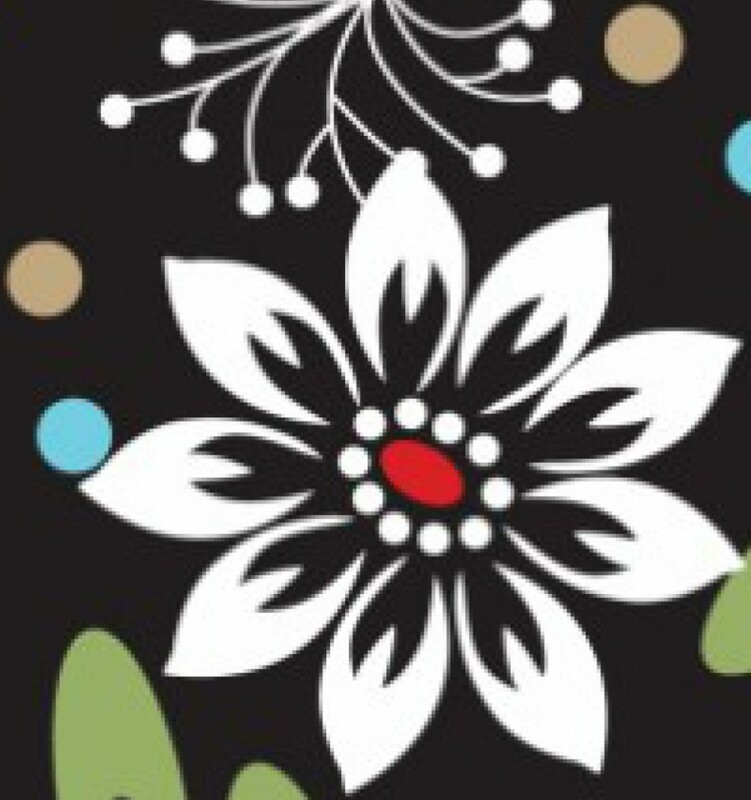 I really love this type of project as well and it is so much fun to work hard on and see what a great outcome. Thank you so much for your encouraging words. It was quite a challenge and took a long time, but I love it now that it is done! When you’re hot, you’re blazing hot, UpMom. You took this Lane Hope Chest into a gorgeous present. It’s quite a nice state that your community of family and friends knows what you are on the lookout for the most. Way to to! You are too kind Mark! I sprouted some gray hairs during this project, but the outcome was worth it! Amazing job! 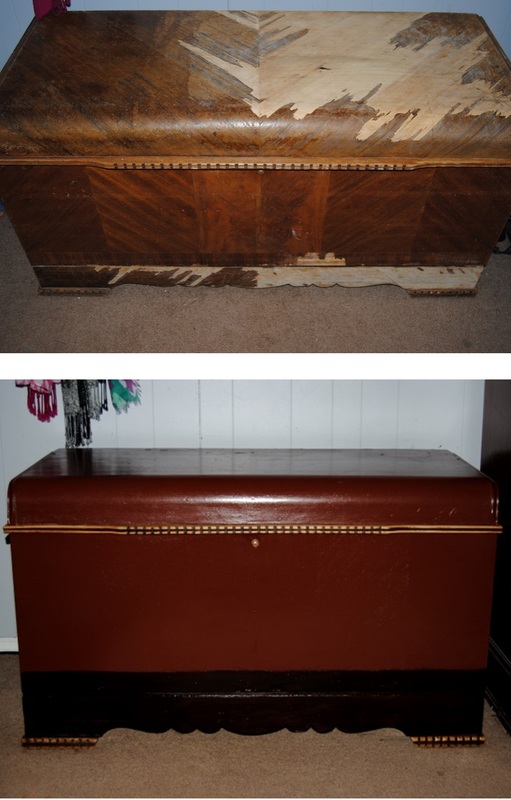 I recently fixed up an old hope chest and wrote a post about. I’m nowhere near as skillful as you! I love how you stayed true to the piece! 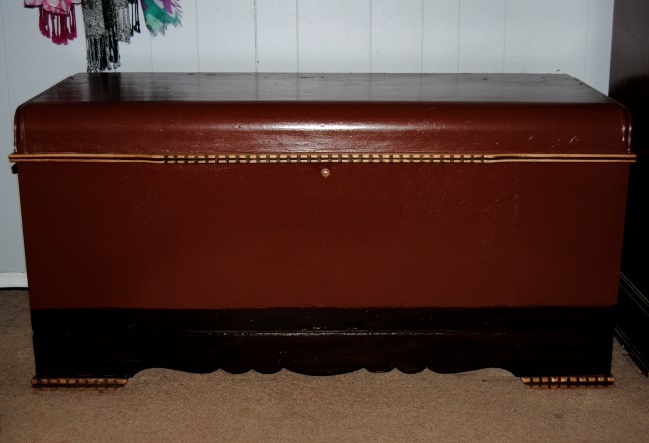 I just found a similar chest on Facebook I want to buy (it will complete my bedroom with Art Deco/waterfall style). 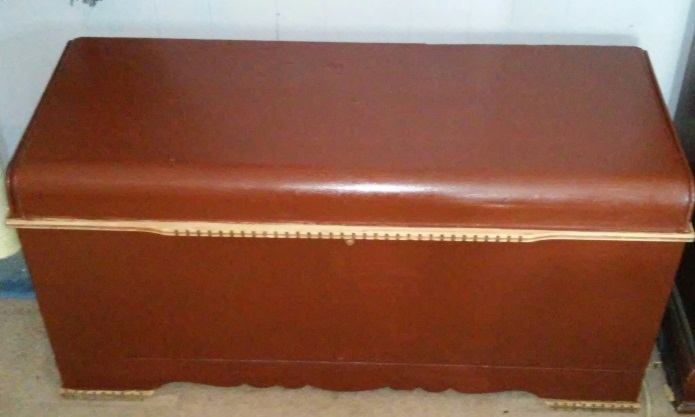 I found this same cedar chest at a garage sale. The veneer isn’t in as bad a shape as the one you found. It does have a few flakey spots on the bottom though. I was more than HAPPY to pay that $50 for this. I love it! I was very lucky to have it gifted to me, 50 is a great price though.. thanks for stopping by!!! Hi! I have the same Lane Chest with the stamp. Where did you find the serial number? I see a lot of patent numbers on the inner lid, right of the Lane stamp. Thanks!